Register your calf with the number that you used to tattoo the calf. Tattoos are in the calf’s left ear. This leaves room in the right ear for a Brucellosis vaccination, if you decide to do that. A calf halter and a secure area. A stanchion is a great area if possible. Soft bedding so that if the animal goes down, they will be protected. Alcohol, paper towels: for cleaning ear and sanitizing equipment. 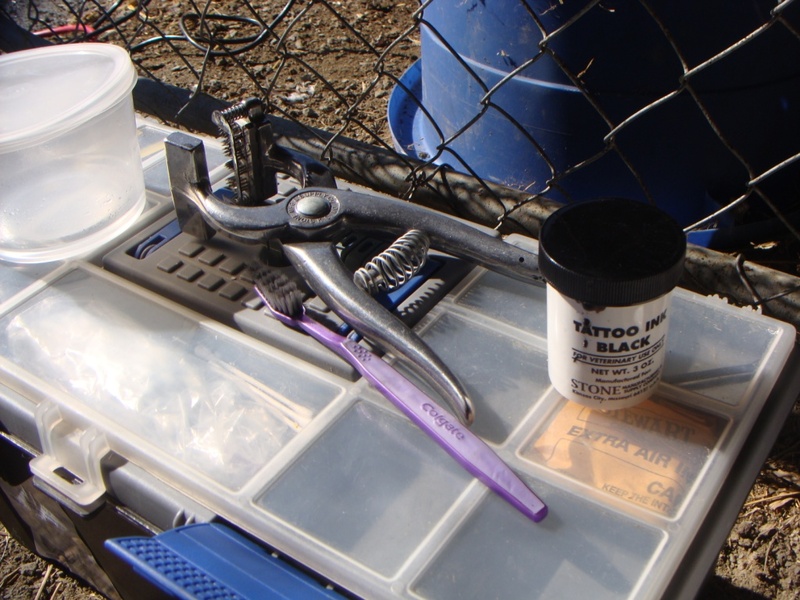 A tattoo kit: Ours included the pilers, digits 0-9, and ink. Holds 4 digits. You must buy any letters individually. For example, if your herd is named Champion, then your tattoos would start with C105, C106, etc. Determine a method of numbering calves if you have a lot. For example, you could start your small herd at 01 or 100, working your way up as you have more calves. This method helps you determine age by knowing who is older or younger based on their number. Secure calf and have one person hold the calf and help hold out the ear while the other person works the tool. Scrub the left ear with a paper towel saturated in alcohol. Make sure the ear is very clean and dry. We put the tattoo above the top ridge in the calf’s ear. You can also place the tattoo below the top ridge, if you can keep it between two ridges without touching the ridges. Ink the numbers on the tattoo with the toothbrush, then ink the ear fairly thick with the toothbrush. 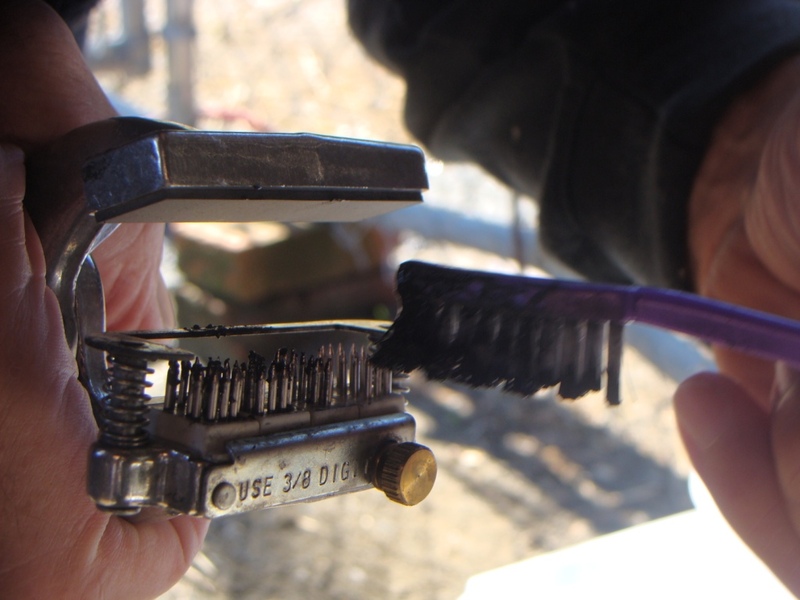 When correct placement is determined, squeeze down very firmly with the pliers and hold down for a couple seconds. 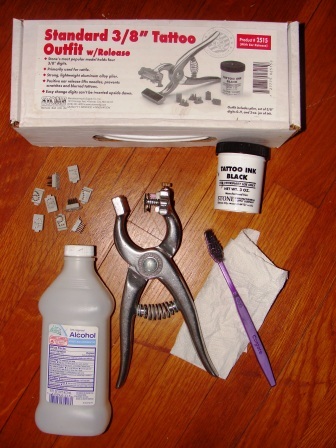 Remove pliers by opening the tongs and carefully remove from ear to avoid scratching. Re-ink the ear thoroughly with more ink from the toothbrush. Clean all equipment and put it away together so everything is ready for next time! The letter refers to the vaccine used – in this case, RB-51. The shield is a symbol. The only information this tattoo would give you is to indicate that the animal (above, in photo) was born approximately in the year 2001 or 2011, within a year. I have a Jersey cow that is supposedly not registered, but I found a tattoo in her ear! Can that tell me how old she is or where she comes from? Does AJCA have information on her? A tattoo has to have a letter and number. It does not specifically identify a cow other than within her own herd. Note: Farms can pretty much do any sort of numbering system, they don’t necessarily all follow the same rules! On our farm, the letters = the farm name. My husbands farm was Family Hill, so the letter was F. My farm is Spirited Rose, so the letters are SR. IF you can find the herd she originally came from (Heartland, Happy Hills, something H likely) then you can track the individual animal within that herd and AJCA might be able to help identify the cow, IF the cow was registered and the tattoo was not just for identification within the herd only.The numbers may correspond with the animal’s birth within the herd and might tell you age if you can find the farm. For example, 136 would be the 36th calf born in X year (perhaps 2011) on the farm (Family Hill). Family Hill farm had maybe 30-60 heifers born each year, so that calf would have been born later in the year. But if the farm had 100 heifers born in a year, then you’d probably have a Jan/Feb calf.For my small SR herd, I’ve only gotten up to #24, because I have so few offspring. So it just means it’s the 24th calf I’ve registered and therefore is the youngest, but wouldn’t tell anything about age, except that it was the youngest in our herd.